Micron (NYSE:MU) has performed strongly over the past couple of years. The company reported record revenue ($29.5 billion,+64% year-over-year) in 2017, and expects to grow by nearly 33% annually over the next two years. 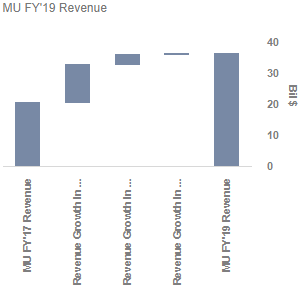 Revenue growth was seen across all the segments – DRAM, Trade NAND, and Other products. Supported by continued strong growth in both DRAM and NAND demand, due to broader trends in the data center and mobile markets, as well as increased adoption of SSDs across enterprise, cloud, and client PCs, this bodes well for the company’s growth outlook. Micron Technology generates revenue from three primary sources: DRAM, Trade NAND, and Other products. The DRAM segment generated around $13 billion in 2017, and we expect it to grow by 39% annually. Emerging technologies such as cloud computing, big data, and artificial intelligence are driving strong growth in the industry. Trade NAND generated around $6.2 billion in 2017, amid strong growth in Gigabits sold, offset by declining average selling prices due to strong competition and unfavorable macro conditions. Strong improvement in market share amid improving market conditions, is likely to drive the revenue by 23% annually. Other products generated $1.1 billion in 2017 and we expect them to grow by 10% annually.